Whether you’re looking for wine, craft cocktails or just a tasty beer, the Stevens Point area in the middle of Wisconsin is a perfect destination for discerning palates. That’s because Portage County is home to the Central Wisconsin Craft Collective, a group of local businesses that are helping turn the Stevens Point area into a must-stop destination for beer lovers, wine connoisseurs and folks who appreciate a good Old Fashioned. The Craft Collective includes four breweries—Point Brewery, Central Waters Brewing Company in Amherst, Kozy Yak Brewery/Fresar Winery in Rosholt and O’so Brewing Company in Plover—as well as the newly opened Sunset Point Winery in Stevens Point and Great Northern Distilling in Plover. 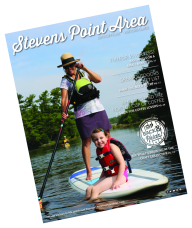 Now, the Stevens Point Area Convention & Visitors Bureau (SPACVB) is giving its fans a chance to win a VIP brewery/winery/distillery trip to Portage County in the Central Wisconsin Craft Collective Sweepstakes, which launched this week and runs through Oct. 30. To enter, fans can visit the SPACVB website or Facebook page and click on the sweepstakes link. One winner will be selected at random to receive the grand-prize package, which includes lodging for up to four people in the Stevens Point area, tours, tastings and merchandise from the members of the Craft Collective and travel and dining vouchers. Point Brewery, Stevens Point. Established in 1857, Point Brewery is the fourth-oldest continually operating brewery in the country. The brewery has seen several expansions since 2010 and continues to take home national awards for its brews. Central Waters Brewing Company, Amherst. Central Waters takes its commitment to the environment seriously, boasting locally sourced materials for brewing, bottling and packaging, as well as two large solar arrays. Don’t miss the River Run & Great Amherst Beer Festival on Oct. 10. O’so Brewing Company, Plover. This so-called “freestyle brewing” company is celebrating its eighth year of operation in November. Its proud Wisconsin roots are on display at the brewery’s tap room, where you can find 40 beers from across the state on tap. Kozy Yak Brewery/Fresar Winery, Rosholt. Kozy Yak has been serving ales, stouts and lagers since 2012, and visitors can also sample tasty wines from Fresar Winery when they stop by this homegrown business. Kozy Yak is temporarily closed for two months while undergoing a renovation. Great Northern Distilling, Plover. Opened in 2014, Great Northern Distilling creates small-batch spirits using ingredients from within 150 miles of the distillery. Don’t miss the distillery’s Mixology Lounge, where you can find hand-crafted Old Fashioneds, Sonic Screwdrivers and more. Sunset Point Winery, Stevens Point. The newest addition to the Craft Collective, Sunset Point Winery recently held its grand opening in downtown Stevens Point.